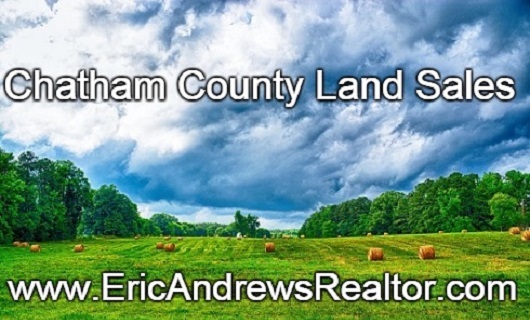 Eric Andrews is Chatham County’s premier land sales expert and the only Realtor in Chatham County with the expertise to achieve ALC accreditation. If you are looking to sell land in the area Eric can and will use his experience, connections and marketing to get the land sold at the best price possible. Contact me directly any time at (919) 548-1014. Why sell your land with a land expert? If you are selling a tract of land, most real estate agents will direct you to someone who specializes in land sales or a Realtor that specializes in this niche. An experienced Realtor that specializes in selling acreage properties knows all of the ins and outs and issues that arise with this type of real estate transaction. They know everyone at the town and are often in direct communication with town planners and corporate purchasing agents. They will look at your land and immediately have a strategy in mind of who your potential buyers may be. It is a completely different world than your standard home sale. People are buying land all over central North Carolina. We are located in the center of historic downtown Pittsboro. Investors are purchasing land in Chatham County due to the upcoming Chatham Park which will transform Pittsboro into one of the largest technology hubs in North America. Farmland and large tracts are also popular here in areas like Silk Hope. Silk Hope is likely to experience a land rush soon as Pittsboro residents move further west to get away from Chatham Park, and of course commercial and residential land sales are going to be extremely popular as people rush in to purchase property in and around Chatham Park. Farms, family tracts, large acreage tracts, farmettes, commercial property, wooded lots and more have been sold, are on the market, or will need to be sold. Some people are hanging on to their land with the advent of Chatham Park. In 2045 Chatham County could be one of the largest tech hubs in the United States. Some property is simply investment land and people may be interested in cashing in now or in the future. Commercial property (or soon to be rezoned commercial property) around highways 64 and 15/501 will be in strong demand for many years to come as corporations and businesses seek to purchase road front commercial property in this area. Large acreage tracts off the beaten path will be in strong demand as well for developers who want to put up dense housing, construct new homes, or build retirement homes and neighborhoods with townhomes. We are located a stone’s throw from the Chatham County Courthouse at 73 Hillsborough Street in Pittsboro. Eric owns land in town as well, and has a large variety of land for sale at any given time. While Eric is the Pittsboro expert he services the entire Piedmont region of North Carolina. He has extensive knowledge of every town in Chatham including Siler City, Pittsboro, Goldston, and Cary (a small portion of Cary resides in Chatham County). He services other unincorporated communities here as well including Bear Creek, Bennett, Bonlee, Farrington, Moncure, Silk Hope, Snow Camp, and more. When preparing land for sale in this area there are several factors to consider. Just throwing your land up on the MLS as a residential property is never a good idea. I have thrown together a few tips on preparing land for sale here, including how land can be listed, where it can be listed, survey information, and much more. The best idea though is to call me for a consultation- the call is free and I will be happy to hear about the land and offer my thoughts. Recently sold. A fraction of my recent sales are online, but we’re working on getting them online. This list will continue to grow. To see property that I have recently sold visit my page Recently Sold. Wondering what types of soil are in the area? Visit my page on Chatham County Soil Types. Go here to read about how to prepare vacant land for sale. Information on 1031 exchanges is here. Would you rather auction your land? Read about Land Auctions in Pittsboro (and NC) here. I am a professional auctioneer as well. Chatham Park News & Information – This resource has the latest news on Chatham Park, the 7,000+ acre development while may make Pittsboro one of the largest technology hubs in the United States of America. My current land listings are here. The Moncure Super Industrial Park – Just announced, another 1,400+ acre land for industrial purposes. More info coming shortly! Thinking about owner financing your land? See my article: Owner financed land sales or watch the video below. If you are looking for large acreage tracts, you will not see all of them online in one place. Some lots may be listed on the MLS. If you would like to search for available properties on the MLS please use the advanced MLS search on my site here. Commercial real estate, farms, and other large parcels of land are searchable through websites such as Loopnet.